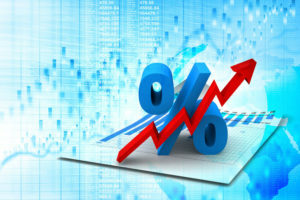 The Federal Reserve just increased it’s rate by a quarter point and the word is that the rates will only continue to increase over the coming months and years. But what does this mean for consumers? What will happen to cash-tied funds like savings, mortgages, or auto loans? Those looking for a home will obviously be most concerned with how mortgages are affected, but the way other cash-tied funds will be altered is also important. This is because the current state of all existing loans will weigh heavily on the financial situation of those who have taken them out or plan to make use of them in the near future. When the Fed started raising rates a while back the mortgage industry saw a slow but steady increase on interest rates. This trend promises to continue. The average 30-year fixed-rate mortgage sits at 4.7%. This is over half a point increase from 2015, when the interest ratings sat at 4.09%. Adjustable rate mortgages will also be affected with rising rates. What homeowners can do is refinance these loans to a fixed rate loan that is lower than what your ARM will be later this year. This could help save considerable money in the long term. Savings: The average interest rate on savings accounts is still sitting at 0.2 percent. Some of the highest yielding accounts, however, are hitting as high as 2.25 percent. That’s up over a whole percent from three years ago. This means that a $10K deposit will earn $20 in interest over the course of a single year. Credit Cards: Credit cards are already sitting at a historically high average rate of 17.32 percent. As interest rates continue to rise across the board, the already high rate of credit cards will also be increased. This is not good news, considering the average American already has a credit card balance of over $6K. This makes shopping around for the best interest rates is more important than ever. Consumers should also actively work towards paying off all balances before the end of each month. Auto Loans: If you plan on purchasing a new car within the next few months this change will not likely have any big effect on that decision. The quarter-point rise on these loans only equals to $3 per every $25K you take out each month. Even considering a year of payments on a $50K loan it would only increase the national average by $72. Student Loans: The federal loans most students use are at a fixed rate, so they will not immediately be affected by the fed rate hike. Nearly 1.5 million college students, however, use private student loans to help pay the difference in what the federal loans pay and their total tuition/cost of living. These could go up considerably if they feature adjustable rates. It will depend entirely on the exact loan, however. This entry was posted in Blog and tagged Fed Rate Hike, mortgage by Scott Li. Bookmark the permalink.